Located in Cancun's famous Hotel Zone, the Krystal Cancun offers 502 guestrooms distributed across four eight-storied buildings, right on top of the beach. This superb hotel is ideal for families, couples and honeymooners alike thanks to its variety of fun-loving facilities. The hotel features an oceanfront swimming pool with a poolside bar, plus a children's pool, children's entertainment including a Kids' Club and a playground, a relaxing solarium zone, beauty salon, in-house spa, terrace space and lush gardens. If you wanted to explore what's on offer outside of the hotel, the surrounding resort is full of restaurants, shops, bars and entertainment. Krystal Cancun's rooms and suites are designed to suit every type of guest, with a choice of five different room styles available. 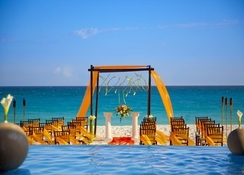 The hotel's restaurants serve up a mixture of traditional Mexican and International cuisines, plus live Mariachi music. 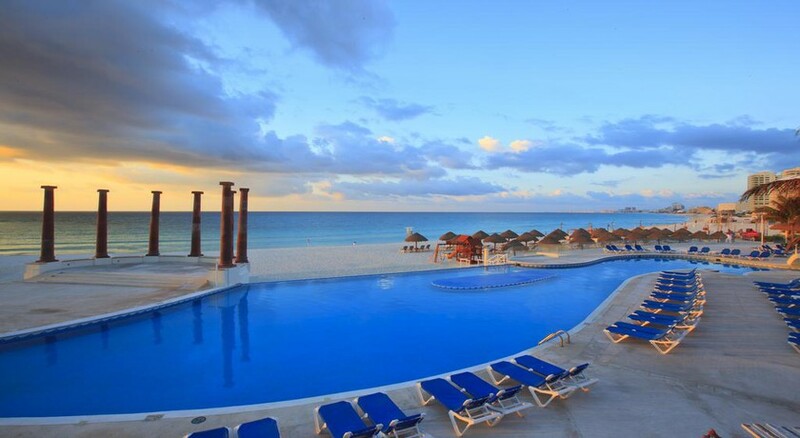 Krystal Cancun is situated at a privileged location in the heart of Cancun's Hotel Zone. It's just a few minutes away from the most famous nightclubs and discos of the area. 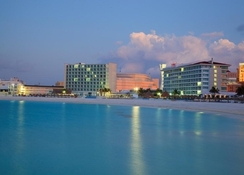 The hotel is very close to the Convention Centre and is a 15-minute walk to lively Downtown Cancun. The shopping village of La Isla is five minutes away. 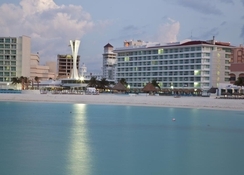 The hotel is a 20-minute drive from the Cancun International Airport. The hotel offers a total of 502 guestrooms. Most rooms are equipped with balconies and views of the Caribbean. Guests can choose between the different types of rooms at Hotel Krystal Cancun, including Standard, Deluxe Ocean View, Club Krystal or Family Studio, all fitted with the necessary amenities and allowing for natural light. Accommodations for disabled guests can be made available if informed earlier. 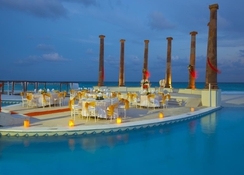 Guests can expect the best of traditional Mexican cuisine when dining in the restaurants at Hotel Krystal Cancun. Hacienda el Mortero Restaurant serves authentic Mexican cuisine, while Las Velas Restaurant serves fresh seafood cooked in Caribbean style. Bars at the hotel include Lobby Bar, Cascada Bar, Pool Bar and a beach club. Here you can also taste the local delicacies like habaneros, jalapeños, ceviches, tequila and seafood tacos. 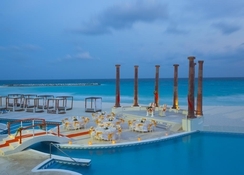 At Krystal Cancun recreational amenities include a splash-tastic oceanfront pool, a steam room, a spa, a whirlpool, a sauna, a fitness centre and relaxation room and a solarium. Activities and children's entertainment programmes are also offered at the hotel, plus the nearest golf course is 3km away. The hotel offers evening shows for guests to enjoy (weather and season permitting). 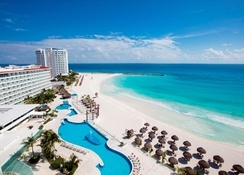 The environmental sanitation tax that will begin to be charged as of March 1, 2019, is $ 24.18 MXN per room per night, applies for our two hotels in Cancun, Krystal Cancun and Krystal Urban Cancun. Taxes must be paid directly at the hotel.